rose & pine: Introducing Mid-Atlantic Pug Rescue's 2014 Calendar! 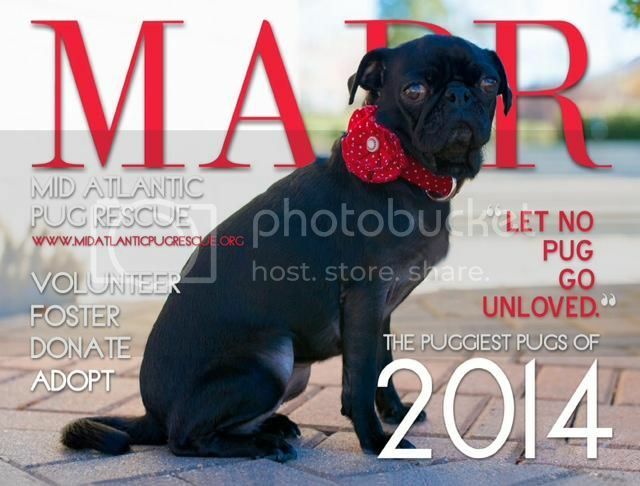 Introducing Mid-Atlantic Pug Rescue's 2014 Calendar! Hey there pals, today I wanted to share something pretty special with you. My friends over at Mid-Atlantic Pug Rescue are taking pre-orders for their annual calendar. MAPR is an animal rescue organization I have been involved with since I adopted my puggle Buttercup from them in 2008. My parents and I have been doing whatever we could to help ever since. Mid-Atlantic is a bit different than other rescues, they do not operate out of a building or adoption center. Dogs up for adoption are fostered out to volunteers until they can get a good home. They specialize in pugs and pug mixes, but they will never turn down a dog due to their breed. My family has adopted all three of our dogs from MARP. My Buttercup in 2008, my mom's Angel in 2012, and my dad's Sophie earlier this year. I can not imagine my life without them, so I am extremely thankful to MARP for helping us find them. All proceeds for the calendar will go to MAPR to help all the little puggies in need. Calendars are $20 for one and you get a bigger discount for each one that you buy. They'll make an absolutely great Christmas gift! You can pre-order a MAPR calander or get more information on ordering one here. And don't forget to check out the Mid-Atlantic Pug Rescue site! You can also join them on Facebook here! Such precious little dogs, I've been wanting a pug so bad for so long!